The restaurant choice does matter. Many restaurants are cooking with local, sustainable, fresh ingredients now, and choosing those types of establishments will make it easier to eat out. 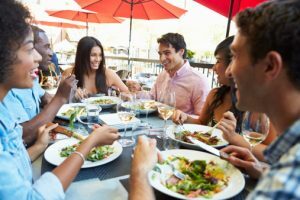 These restaurants can be more expensive, however, and often, you don’t choose where you are eating because it is for work or for a social gathering, and the choice is made for you. At any restaurant, pre-planning can help you make good choices for your health. You can find nutrition information on menu items for most restaurant chains at www.dietfacts.com or www.myfitnesspal.com. This way, you can check the calorie count, sugar/carbohydrate content, and fat content of menu items prior to going out. Salt or sodium content is often listed as well. The healthiest items are not always intuitive, so if you have the opportunity, check and decide what you might want to eat prior to going out. Most restaurants will offer bread or chips for the table prior to a meal. I recommend avoiding this, as you will have plenty of food to come. However, if you have trouble staying away from it when it is placed in front of you, ask them not to bring it at all. I will ask for vegetables to dip in guacamole at Mexican restaurants and skip the chips. When selecting menu items, I look at the protein and the vegetable of each item. Choosing fish that is grilled, baked, or poached is a good choice. Avoid breaded or fried fish. You might eat red meat only when going out, and choosing that is fine. Consider portion sizes, though, because most portions at restaurants are larger than 3-4 ounces which is what you want for a meal. Three ounces is about the size of a deck of cards or the palm of your hand. When your plate arrives, cut off the portion that looks like 3-4 ounces, or if you plan to have more for this particular meal, cut off that amount. Get your to-go box at the beginning and save the rest prior to starting your meal. You can always have more, but this way, you can decide if you had enough prior to finishing the larger portion. If the plate comes with a starch or a grain, it will likely be higher in carbohydrate than you want to have. Restaurant food tends to be more calorically dense than you would eat at home as well. For this reason I recommend asking to substitute the starch/grain for either more of the vegetable that comes with the meal or ask for a second vegetable side. I will peruse the rest of the menu to see what vegetables are already being made and ask to substitute that. Most restaurants will charge two to three dollars extra to make this kind of change. If they won’t do it, I just ask them to leave the carbohydrate ladened side off the plate. If you order a salad prior to the meal, you will have 2-3 of your daily vegetable servings at your restaurant meal! When choosing a salad, avoid dressings that have added sugar. Usually these dressing will have sweet in the name, for example: “sweet soy” dressing, or they will be called “citrus” or “honey” dressing of some sort. Added sugar in salads also comes in the form of sugared nuts. You can ask them to use unsweetened nuts, or simply leave these off. You may enjoy lemon and oil for your dressing at home, and you can ask for fresh lemon and oil to dress your salad with–that is always a fresh and tasty choice. You could also ask for vinegar and olive oil, which most restaurants can often accommodate. I recommend staying away from fat-free dressings as they often have added sugar for flavor, not to mention the chemicals added for texture. If you want something sweet after dinner, ask for fresh fruit. Often the restaurant will have lovely fresh berries, and you could have them put on some cream for an extra treat. By asking for some simple changes and by planning ahead, you can go out to eat with family and friends and eat in a very healthful and satisfying way.